Greeks ask: Why all the suffering? Increasingly Greeks see themselves as victims. One paper opined that the country was being placed on a "sacrificial altar". Another said Greece was being turned into a "poverty house". These judgements followed the unveiling of the latest austerity measures. Even in the announcement itself, you could detect the government's timidity. Earlier in the week, the government had spoken of critical days ahead. Everyone knew that the finance minister was talking to the so-called troika - the EU, the IMF and the European Central Bank. Statements were promised and then silence. A void. There was widespread speculation as to what would be in the austerity plan but, for a while, it seemed as if the government was happy for nothing to be confirmed. Apparently voices in the government said it was simply wrong to leave the population in the dark. So last night a government statement came. Thirty thousand civil servants have in effect been placed on notice that they're heading for redundancy. Those with pensions above 1,200 euros (£1,047.71) a month will see a 20% cut. The tax threshold, which has already been lowered, will now kick in at 5,000 euros a year. It means many lower-paid workers will start paying tax. The property tax - revealed less than two weeks ago - is to be extended until 2013. Those with 100 sq m apartments will end up paying close to 2,500 euros over three years. And this may not be the end of it. The aim is to get the deficit down to 7.3% this year. It will be a tough ask. The government needs to find savings of over 6bn euros. Certainly with the property tax there will be resistance. The power unions may sabotage the money being collected. The negotiations with the IMF and the EU are not complete and further spending cuts could well be announced in the days ahead. The Greek people are increasingly asking what the point is of this pain. Finance Minister Evangelos Venizelos said it was to avoid defaulting and to keep Greece in the euro-zone. He said the government would do "anything" to stay in the single currency. Many many Greeks are not persuaded by this. They have limited attachment to the European Union. They see years and years of austerity ahead. In their view, they are being forced to accept deep cuts to protect the French and German banks. Another paper called the latest measures "a merciless raid". Particularly in the private sector there are those who say that Greece's future prosperity depends on shrinking a bloated public sector. They say that future generations will thank them for making these changes. But Greece is a divided society. Again and again people ask where all this is heading. What is the end game? During the last two years the economy has shrunk by 10%. It is one of the reasons why Greece failed to meet its targets. And yet - in the eyes of many - the same medicine is being repeated. Unemployment is now at 16.3%. So faith and confidence is ebbing away. A few days ago I met a number of middle-class families. All had children. All of them were exploring moving to Canada or Australia. They see a future elsewhere. And here is the unanswered question. Even if Greece gets the next tranche of bail-out money in October - which seems likely - what then? Greece's debts will continue to mount and growth will not return until 2013 at the earliest. Most analysts believe that a default is inevitable. In which case the question will follow: "What is all the pain for?" So Greece continues on its painful path. Time is bought for Europe's banks to make their balance sheets better able to withstand losses. 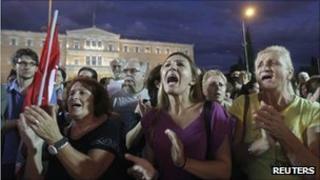 For Greece there is the prospect of months of strikes, protests and upheaval.